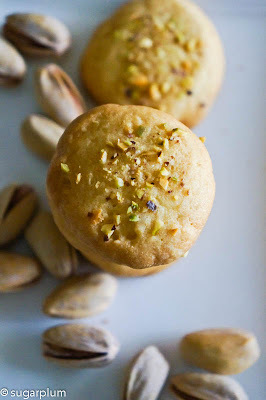 Another perennial favourite cookie for Chinese New Year is the butter cookie. 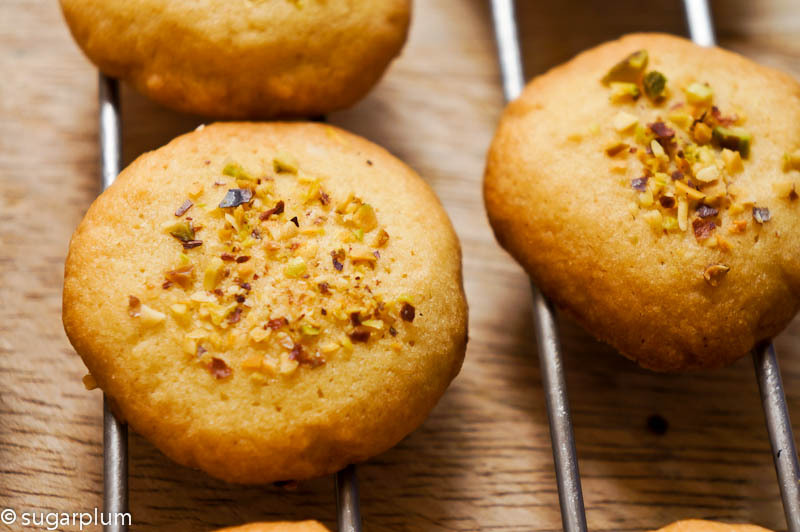 It is normally topped with a slice of almond and has is richly buttery and crumbly at the same time. The recipe is one where you spread it into a pan, then cut into squares after baking. Unfortunately I lost a lot of recipes when I misplaced my Home Science recipe book. Home Science was still taught when I was in secondary school, and all recipes were painstakingly hand-written down (imagine that!). My friends and I still have fond memories of our various kitchen antics and mis-adventures. Anyways, I found a butter cookie recipe which I liked. It has a wonderful butter flavour, and a light, crisp texture. The original recipe called for it to be piped through a star-nozzle. Well, I had no piping bag and never piped before. Improvisation #1. Having seen kitchen maestros work with ziploc bags as icing bags, I thought it would be a piece of cake to replicate the same. They made it look easy. No nozzle? Just snip a corner off and pipe them like macaroons. Haha. Wrong. The piped cookie dough looked like fingers. Darn. Not the look I was after. Improvisation #2. Chilled the dough for a few minutes ( it was definitely wilting from the kitchen humidity). Then took teaspoonfuls to quickly roll into balls and flatten on the cookie sheet. This worked fine, but the cookies looked kind of forlorn and plain. Improvisation #3. Sprinkle some nuts over before baking. 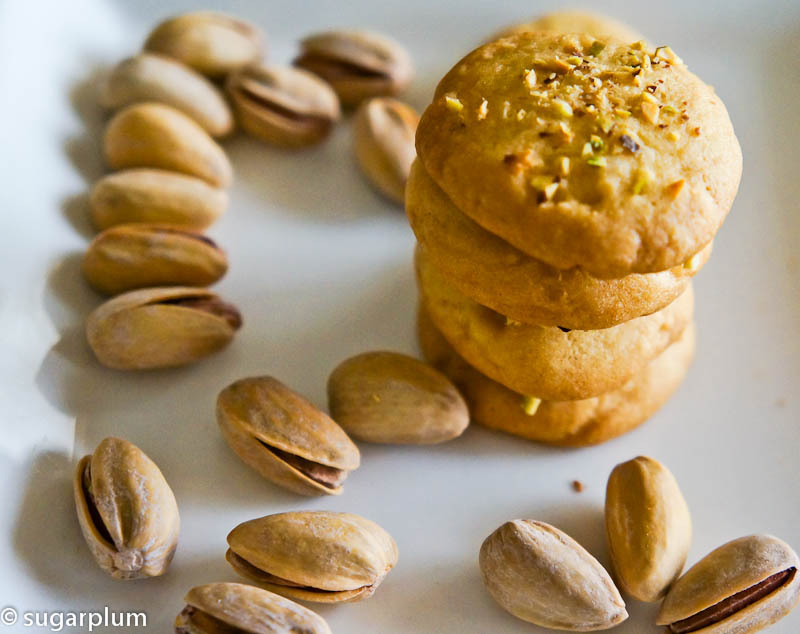 I chopped some pistachios and sprinkled/pressed them over the cookies before baking. Pistachios are great because you get green-brown colours from the nuts and different textures as you bite into a cookie. Also instead of just butter, you get a mild pistachio flavour too. Not as boring looking and somewhat more contemporary. Hurrah! Great served with a cup of tea as it has a delicate flavour. 1. Preheat oven to 190C and lightly grease the baking sheets. 2. Cream butter in a bowl until smooth and pale. 3. Add in the sugars and cream until fluffy. 4. Beat in the egg, about 1/3 at a time. Make sure you beat well after each addition. Mix should be quite light and pale at this stage. 5. Stir in vanilla essence. 6. Sift the flour and baking powder together and stir into the batter with a spatula. Don't over mix, just incorporate the flour in. 7. Chill dough for about 10 minutes in refrigerator. You want this to be slightly firm to roll into balls. 8. Take about 1 tsp of dough at time and roll into balls. Work quickly or else heat from your hands will soften the dough. 9. Press each ball gently to flatten slightly, and sprinkle the chopped nuts over. Press the nuts gently into the dough. This will ensure the nuts don't fall off after baking. 10. Bake for 10 - 13 minutes. Remove from oven and gently place on wire rack to cool completely before storing in an air-tight container. I used a teaspoon to help slide the chopped nuts over each cookie. Less messy, and less waste versus sprinkling. If like me you have a super-small oven, keep the dough in the fridge until you are ready to roll out the next batch. If the dough is too soft, it is very difficult to roll into balls. You get hand-cream. Beautiful cookies. Love your idea of adding some chopped pistachios. Thanks for your link love! Hi Christine, thanks for stopping by. Gong xi fa cai!